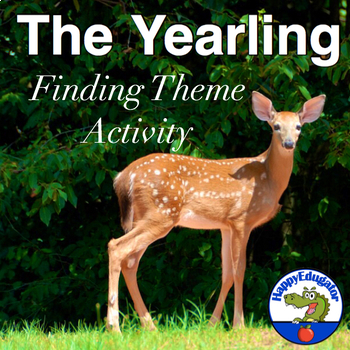 The Yearling Finding Theme and Persuasive Essay. 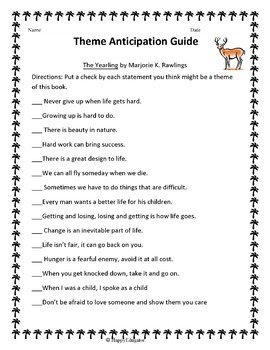 This supplement for the novel The Yearling by Marjorie K. Rawlings includes a Theme Anticipation Guide and After Reading Activity. Students decide on which theme they think is the most important and then support their choice by writing an argument. Use this anticipation guide before you read the classic book or watch the movie about old pioneer days in Florida. 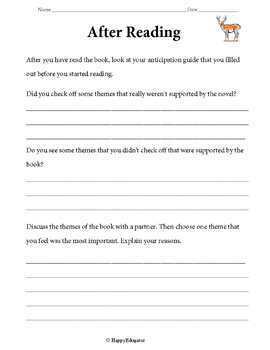 Have students check off which statements they think could be a theme. Then read the book, watch the movie, and have them adjust their thinking as they proceed. Finally, at the end of the story, discuss. Have opinions changed? (Hint: they can all be themes) Students choose which theme they think is most important and write an argument using evidence from the text to support their opinion. 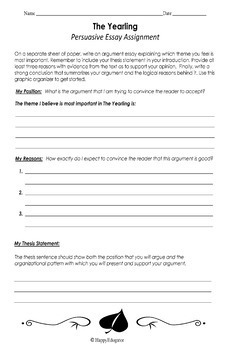 Includes assignment sheet and persuasive essay graphic organizer, along with a standards based persuasive writing rubric.